Carlo Antonio del Fava is an abrasive and experienced lock who is also one of the most-travelled players in the modern game. The South African-born Del Fava's club career began with Natal Sharks but it was soon thrown into jeopardy by a two-year drug ban having tested positive for the anabolic steroid stanozolol. 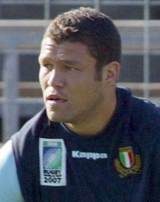 He returned to the game in 2004 with Overmach Parma and was handed his international debut in Italy's last Six Nations clash against Wales despite having played just five senior games. A spell with Bourgoin in France's Top 14 followed and he was also part of Italy's World Cup campaign in 2007 before a switch to Irish province Ulster. Del Fava returned to Italy to play for Viadana in 2009 before moving to the newly-formed Aironi for the 2010-11 season. He appeared at a second World Cup in 2011 and signed for English Championship side ahead of the 2012-13 season before going on to help them earn promotion back to the Premiership.